Virtua Fighter (Japanese: バーチャファイター, Hepburn: Bācha Faitā) is a 35-episode anime series based on the Virtua Fighter series of video games made by Sega-AM2. Targeted towards children aged 6 to 15 years old, it originally aired in Japan on TV Tokyo from October 2, 1995 to June 27, 1996. The episodes take place before the first game in the series, and accordingly portray the characters as slightly younger than they are in the games. A video game based on the series, Virtua Fighter Animation, was released in 1996. The series follows Akira Yuki and his quest to see the eight stars of heaven after he had gotten overconfident in his Bajiquan skills from his days training with his grandfather. Initially traveling to figure out how to see those stars again, he learns that Sarah Bryant was kidnapped by robotics scientist Eva Durix as part of Eva's quest to create the "Perfect Soldier." Akira joins up with other characters in his journey such as Pai Chan, Jacky Bryant, Lion Rafale, Kage-Maru and Shun Di to save Sarah. Some of the following characters who appear in the show are based on those in Virtua Fighter and Virtua Fighter 2, while some were created solely for the show. Unlike his video game counterpart, Akira enjoys eating lots of food and slacking off. Akira fights only when he sees people getting into trouble, but often gets into minor problems, such as when he accidentally touches Sarah Bryant's breast or when he gives Pai Chan a kiss (which results in a beating). Initially meeting with Akira after an encounter in the Los Angeles Chinatown district, she joins up with him so as to avoid being hunted down by renegade Koenkan fighters, her estranged father, Lau Chan and her supposed fiancée, Liu Kowloon. In the series, Pai gets along with Akira despite his everlasting appetite, then eventually develop feelings for him. According to her (unlike her video game counterpart), she learned Ensei-ken forcibly by her father when she was a little girl, rather than by his kind persuasion. Her mother, never shown in the games themselves, was instead shown in the anime, having died of an illness when she was little as opposed to Pai's mother dying when she was 16. Pai's estranged father, Lau wanted her to marry Liu Kowloon so that there would be a successor to the Koenkan. He later helps Pai, Akira and the others to defeat Eva's Dural robot. First appears in Episode 3, "Brother and Sister Martial Arts Team"
Sarah is kind and gentle in the anime. She has a flying squirrel named Alexander for a pet and travels with Jacky Bryant in their RV. Whenever Jacky participates in any Formula One contest, Sarah helps out by doing racing queen duties. She is later kidnapped by Eva Durix to be used as a basis for creating a "Perfect Soldier", Dural. In the series, she has a crush on Akira but later has feelings for Kage. Kage is first portrayed as a mercenary who kidnaps Sarah under the orders of Eva Durix and initially clashes with Akira. While Kage is with Sarah they begin to have feelings for each other. In the middle of the series, Kage decides to assist Akira, Pai and their allies after he had a case of guilty conscience over what he had done that resulted in the creation of Dural. He had also left his Hagakure clan village to hunt down Oni-Maru after most of his people had been massacred by him, who had wanted to kill Kage in order to gain the position as the head of the Hagakure clan. First appears in Episode 5, "In Search of the Stars"
A young teenage boy, the only son of a rather upper class French family. Like his counterpart in the games, he is a practitioner of Tourou-ken. First appears in Episode 17, "A Young Noble Appears"
A rising martial arts practitioner in the Koenkan, he had plotted to use his upcoming marriage to Pai in order to become the next successor to Lau Chan as the next head of the Koenkan. Akira, Jacky and Sarah rescued Pai in Hong Kong, foiling his plot. A former member of the Hagakure clan, he had been expelled by the village elders due to his plot to kill off Kage-Maru in order to become the clan's head. Enraged, Oni leaves to train himself and perfect his skills. He later orchestrates a massacre of his village kin, leading Kage to hunt him down in order to exact revenge for the deaths of the Hagakure clan. A robotics scientist who had wanted to create the "Perfect Soldier". She had assisted Liu in brainwashing Pai so as to "marry" her without any pressure. The brainwashing fails, and after Akira, Sarah and Jacky rescued Pai from Liu and the rest of the Koenkan, Eva seeks the backing of the Rafale Corporation. She employed the mercenary ninja Kage-Maru to kidnap Sarah to use her for the basis of Dural. Dural's origins are much different here than in the game versions; it had been created by robotics scientist Eva Durix through the backing of the Koenkan and later, the Rafale Corporation after Eva had a fallout with the Koenkan. 12. Subway Out of Control! Virtua Fighter had been aired in various television stations in Argentina, Chile, Italy, Mexico, the Philippines and the Arabic part of the Middle East, dubbed in their national languages. The series had been licensed for distribution in North America by Anime Works. 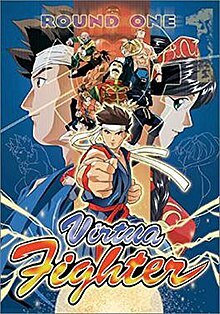 Due to falling sales, Anime Works had ended its distribution of the Virtua Fighter anime after dubbing 24 of the 35 episodes, and no other licensor picked up the series. Hanami Gumi had praised the Virtua Fighter anime series, calling it "one of the best among those anime series that had fighting-game origins". The review said that the show had a clear, non-confusing plot, along with good characterization and background music. Asian Stuff has praised the series for its plot, saying "the fights don't drag on and that it doesn't resort to repetitive tournament crap". An EX review had commented highly on Ryo Tanaka's character designs in the series, as they are "simple yet very effective in revealing the nature of the characters." ^ "The Animated Series". Maximum: The Video Game Magazine. Emap International Limited (2): 131. November 1995. ^ "Virtua Fighter Mania". GamePro. No. 89. IDG. February 1996. pp. 28–29. ^ "RESUME". amytipton.com. Archived from the original on February 13, 2018. ^ "Juliet Cesario - Resume". julietcesario.com. Retrieved July 2, 2017. ^ Virtua Fighter. Retrieved on February 5, 2008. ^ Virtua Fighter - Buried Treasure. Retrieved on February 5, 2008. ^ a b Virtua Fighter. Archived 2007-10-29 at the Wayback Machine Retrieved on February 5, 2008. ^ Anime Review: Virtua Fighter. Archived 2010-04-09 at the Wayback Machine Retrieved on February 5, 2008. ^ EX's Virtua Fighter Review. Archived 2008-05-11 at the Wayback Machine Retrieved on February 5, 2008. This page was last edited on 20 February 2019, at 15:14 (UTC).